I remember having a bit of a moan about the lunchtime kickoff time when Leinster hosted Toulouse back in January - I take it all back. However much that timing ground my gears, this one on a Saturday night does even more so. Just to clarify; it's not too bad for me personally, given how my Leinster fandom has long since reached a level of nerdery whereby I'd still show up in the early hours of the morning if that's what the alickadoos demanded, but for this match in particular I have a sneaky suspicion we could be in for one of the lowest attendances in the province’s recent history. For one thing, the Italian teams tend to draw the smallest crowds anyway. Then there's the fact that we're guaranteed a home semifinal even if Benetton repeat their upset victory from last season. Then there's the freaky April cold snap we've been having lately. Pop a start time on top of all that which falls right when many are going to or starting to get ready for weekend socialising (generally in warm surroundings) and it could well make for a sparse crowd, though having said that, I dare say the tally will still beat the average of at least half the teams in the competition! Now just in case the smug predictions of a smart arsed blogger weren't enough to make you determined to go just to prove me wrong, let me try and sell it to you in pure rugby terms. 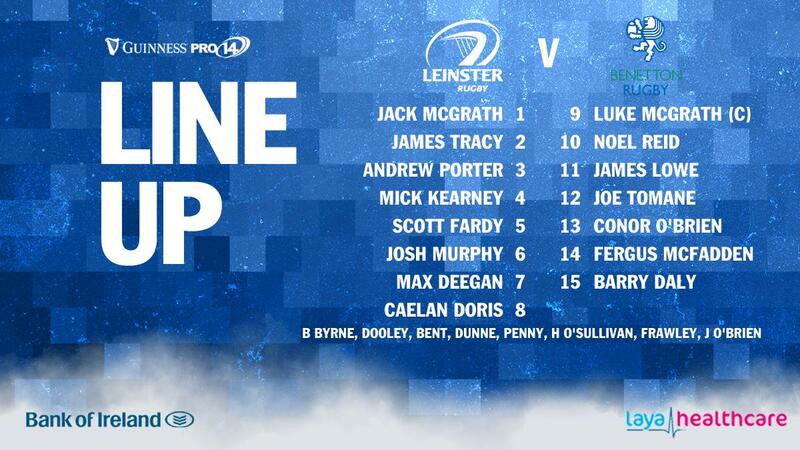 Dan Leavy's horrible bad luck on the injury front, together with Josh van der Flier's absence and Sean O’Brien's apparent mojo deficiency means the bulk of our attention for these remaining three matches (which I'm dubbing our ‘Midseason Preseason’) has to be on our back row, particularly the number 7 position. With all due respect to Scott Penny who is an awesome prospect, I'm delighted Max Deegan is getting the first crack at the role. He has excelled mostly at number 8 since his rise to the full Leinster team, but he is both extremely skilled and willing to learn and I see no reason why he can't have equal success at openside. That said, I hope to see a shift from Penny of 25m or more as well on the night if possible. It's quite the strong front five we're sending out, isn't it. I certainly wish Jack McGrath all the best in his move up the M1 and it came as no surprise. With Church rediscovering his form and Kilcoyne getting regular starting time at Ulster, the change makes perfect sense for Jack. Noel Reid gets the number 10 jersey - he really has been Mr Versatility for us this season though it is something of a surprise to see him there as Ciarán Frawley is on the bench. It will be interesting to see how he controls the game, but I'm wondering if his presence there is an opportunity for Luke McGrath to take on more responsibility than just being captain. I thought our 9 did well against Ulster last weekend but his role as facilitator was outshone by his opposite number Cooney who was more of an orchestrator; perhaps we'll see more of this from Luke this week as he plays his way back to match fitness. Outside the halfbacks, I'm delighted to see Joe Tomane get another shot at 12 - I was critical of him against Edinburgh but that's not to say he should be denied a chance to play his way back to form after a long layoff of his own; this is a perfect chance. Last but not least there's James Lowe. It would be difficult to leave either Scott Fardy or Jamison Gibson-Park out of the semifinal lineup but wouldn't it be just like the Kiwi fan favourite to produce the kind of display that will have Leo & co giving it serious thought. For the corresponding fixture last season, the bookies predicted a 31-point Leinster win, and we all know how that turned out. This time with the Italians still very much in the playoff and European-qualifying hunt, that margin has been shaved back to ‘just’ 14. 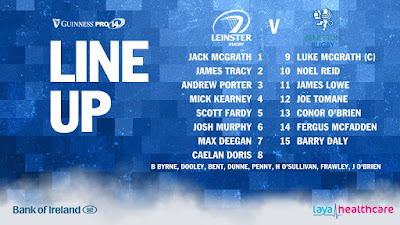 One thing is for sure - they won't be coming to Ballsbridge just to make up the numbers, but if the likes of Luke, James and Max can settle early and we play with the kind of cohesion that helped make this match ‘redundant’ as far as our final placing is concerned, I reckon we can beat their prediction. I'm in a confident mood this week so I'm going for a home win by 17-19pts. 8 Toa Halafihi, 7 Abraham Steyn, 6 Sebastian Negri, 5 Federico Ruzza, 4 Irné Herbst , 3 Marco Riccioni, 2 Luca Bigi, 1 Nicola Quaglio. Replacements: 16 Tomas Baravalle, 17 Derrick Appiah, 18 Simone Ferrari, 19 Marco Lazzaroni, 20 Giovanni Pettinelli, 21 Tito Tebaldi, 22 Antonio Rizzi, 23 Alberto Sgarbi.